Springtime! A perfect time of year to think about building and refinishing your deck. In this workshop, the pros of Eastside Lumber will give attendees an overview of decking materials; including ipe, cedar, pine, and composite decking. Participants will cut, screw and drill into each type of material to see how they differ in ease of use, weight, density, and appearance. Eastside Lumber will also explain the support framing of decks. Environmental standards for treating pine have changed; learn what your options are. 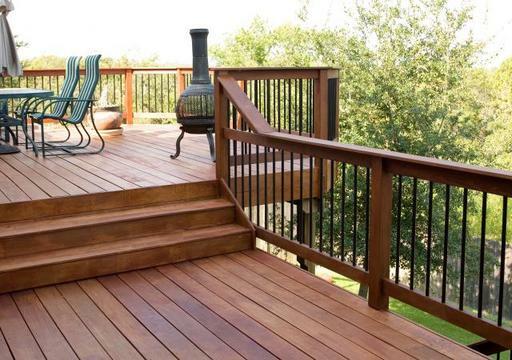 Maintenance of decking materials is also a consideration when choosing materials. Participants will take a weathered deck chair, strip it, and clean it. Participants will then apply a penetrating stain and sealer to an already-prepped chair. Workshop participants will take a tour of the lumber yard and learn about different kinds of construction lumber, wood grades, uses and sources so they can be better informed about building materials for their future projects. Each participant will receive an Eastside Lumber t-shirt or hat. This workshop is great for anyone interested in the deck building and maintenance processes. Participants must be 18 or older and sign a release prior to beginning the workshop using Eastside Lumber & Decking's tools and equipment. The workshop will be led by Jennifer Chenoweth, salesperson for Eastside Lumber and artist at Fisterra Studio; and Randy Meek who remodeled and built custom homes in Austin before starting Eastside Lumber in 2009. Jennifer Chenoweth is an artist in Austin, creating sculpture and painting in many different materials through Fisterra Studio. She heads business development for Eastside Lumber, which is hosting the Decking 101 workshop. Eastside Lumber & Decking is a full service lumber yard in Austin offering expert advice, “hotshot” deliveries, and competitive pricing. Eastside Lumber is a locally owned, relationship driven customer service business providing high quality construction materials in central Texas. Eastside Lumber & Decking is located in East Austin, backing up to the Lower Colorado River. Our location is 1.8 miles east of I-35 on Cesar Chavez, just east of the light at Pleasant Valley, next door to the IBC Bank on the corner.